Montauk's newest hotel has a beachy vibe with a view. Photo courtesy of Hero Beach Club. THE HAMPTONS - Heading to the East End of Long Island this summer? Here's what's old: weekend traffic. And here's what's new: pop-up restaurants, seasonal shops, and boutique hotels. Consider this your summer checklist. Home decor website has opened their first shop in the former Rogers Memorial Library. Open through Labor Day, the iconic building is decked out in one-of-a-kind vintage pieces, furnishings exclusive to OKL, and other home goods. The second outpost of lifestyle concept store has opened on Jobs Lane. Stop by for a curated selection of women's ready-to-wear and accessories from brands like Victoria Beckham, Sonia Rykiel, and Maiyet. Nestled among the Shinnecock Reservation's cigarette kiosks and dilapidated teepee on a stretch of Old Montauk Highway is a cute, new seasonal food stand called . The hard-at-work staff churn out plump and juicy lobster rolls of various styles — including classic, diablo, BLT, and Italian (made with EVOO, parsley, no mayo). Call ahead and pick a few up to eat while stuck in weekend traffic going out further east. Inspired by the classic beauty of Mykonos, is bringing Southern Aegean fare to Montauk Highway. 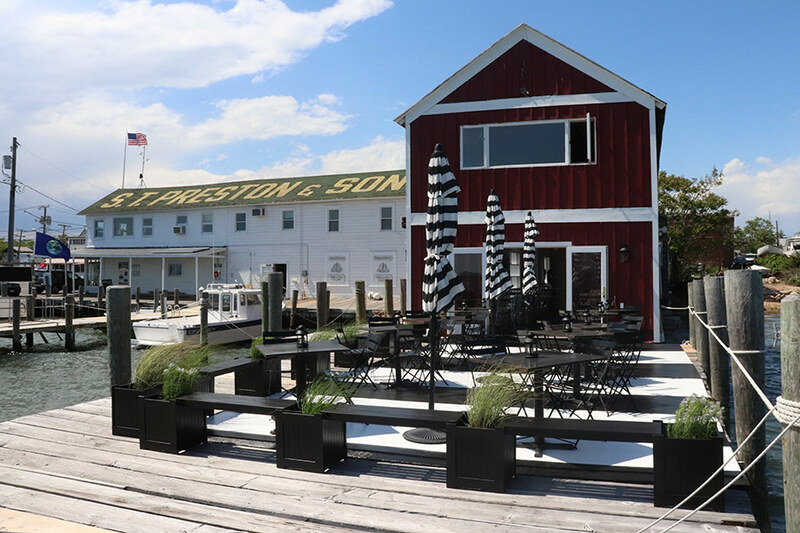 Big and small plates made with local fish and vegetables will be on offer, including a family-sized salt-baked striped bass and lobster bucatini. Scallops at The Maidstone. Photo by Melissa Hom. 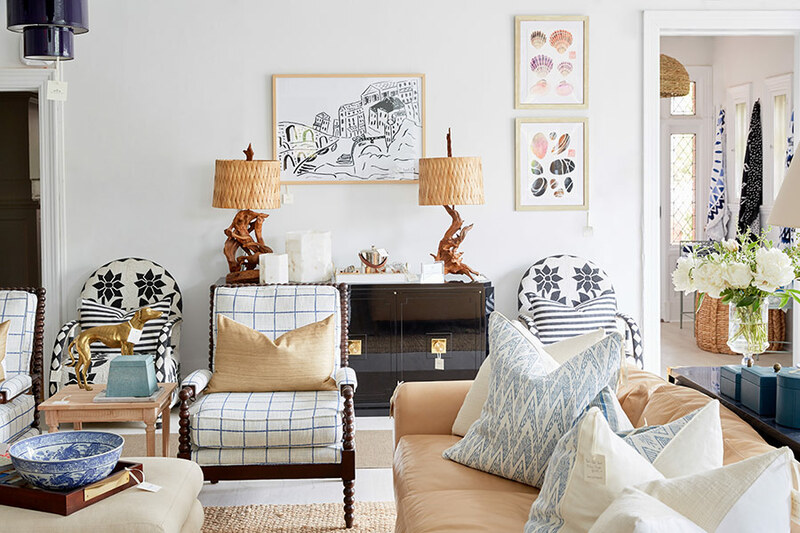 Your new go-to for preppy beachside decor. Photo courtesy of One Kings Lane. Interior designer Stephanie Michaan is showcasing her modern and minimalist aesthetic in the tiny whaling village with , a home decor pop-up selling Turkish towels, tabletop ceramics, and coffee table books. On the calendar for summer: writing workshops, art shows, and plant-based brunches. New year-round bistro is serving woodburning cuisine from an in-house grill and oven. Sit up front for casual vibes or head to the back for tablecloth dining. Legendary NYC restaurant Eleven Madison Park is heading east with a seafood-centric pop-up in the old Moby's space. reservations are exclusive to American Express card members. Everyone else is welcome to drop in. Chef David Standridge of popular West Village spot Cafe Clover is introducing a new seasonal and ingredient-driven menu at . 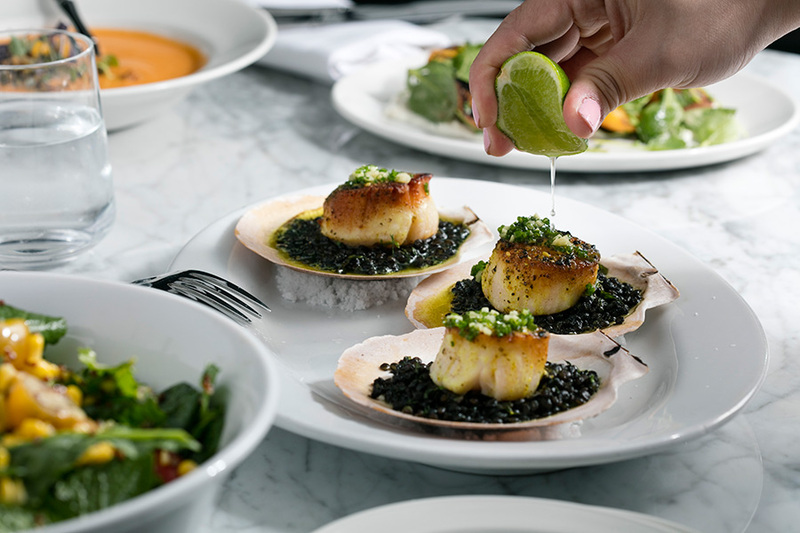 Dishes include seared Montauk fluke with avocado, summer corn, white gazpacho, and hazelnuts and a dish of Montauk Pearl Oysters with champagne mignonette. The hotel's common spaces have also undergone a refresh with a whimsical look that plays off the traditional American and Hamptons aesthetics. Goop is making its South Fork debut with a pop-up shop called . On offer: Gwyneth Paltrow-approved non-toxic skin care products, swimwear, beach towels, and daily deliveries of Eli's Market bread. 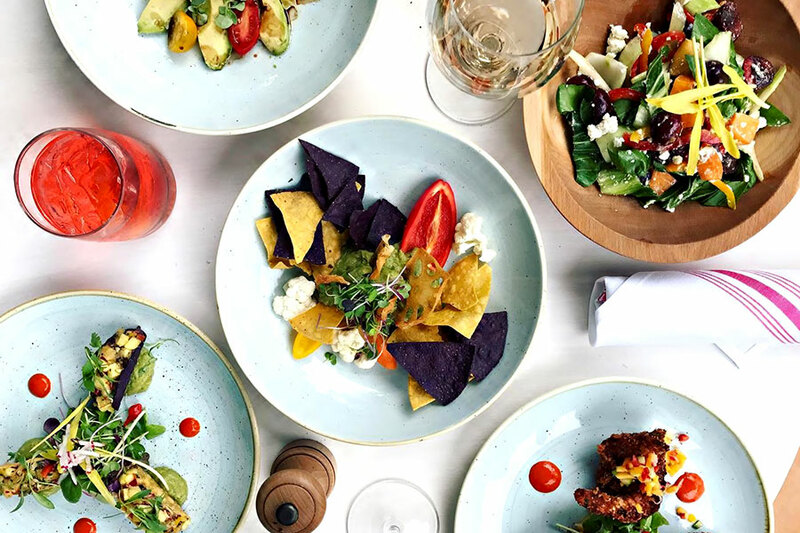 Rosé lovers take note: has expanded with a second restaurant focusing on fresh fare inspired by the blush-hued wine. Simple Italian dishes with a view of the water. Photo courtesy of Barbara Bianca. Rosé-inspired fare. Photo courtesy of Wöllfer Kitchen. Our pals at are bringing their easy-breezy India-made dresses to the beach. From July 22-23, they'll be showcasing brands like Outdoor Voices and India Hicks at . You can also find them at the on July 8. Book your next overnight at the new 30-room . The hotel's original 1950s architecture has been thoughtfully restored with a nod to the past and upgraded with crisp modern interiors. The lobby doubles as a showcase for contemporary art inspired by Montauk's culture. 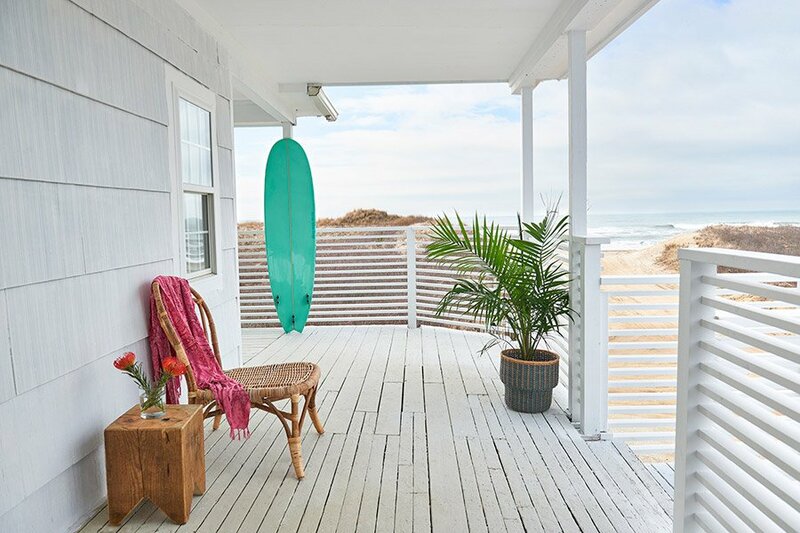 Situated on a private beach overlooking the Long Island Sound, is a new seaside resort with a classic-meets-modern aesthetic and rooms that open directly onto a waterfront deck. Chef Galen Zamarra, of NYC's Mas (farmhouse), will be manning the kitchen at , where you can expect plenty of fresh seafood and local wine. Housed in a charming red barn suspended directly over the water, is chef Frank DeCarlo's ode to the old fishermen of yesteryear. On the menu: simple Italian dishes made with the freshest of ingredients. The Standard's hotel booking app is now offering last-minute stays in a few of our favorite local spots including The Chequit, The Maidstone Hotel, and Hero Beach Club.